My parents married on the 6 th April 1929 in the Church of England Church at Leonard St Victoria Park W.A. My first sister, Pamela Joan, was born on 12 th July 1930. My second sister, Daphne Alice, was born on 18 th April 1932 and I was born on the 6 th April 1934 (on my parent’s 5 th wedding anniversary). I have little knowledge of the years up to about 1940, except a few vague recollections of some of the events when we all lived at No 42 Surrey Rd Rivervale. In about 1940 my parents moved to a new house that they had built for them on the corner of Hubert St and Somerset St, East Victoria Park. The original house still stands today. My sisters and I grew up in this house. From 1940-41 I still have some clear memories of my father during this period. There were many things to do around a newly built home. In those days you did it all yourself – no building “packages” with landscaping, paths and fences included. I can recall my father building stone walls to retain gardens around the areas that were to be planted with buffalo grass, laying concrete paths and putting up wooden paling fences. Looking back, I don’t know where he got the time or the money to do so much. Restoration of an old wooden dining table and a set of matching chairs was something else I can remember. I’m sure there was much more I have forgotten. But the last memory of my father is quite clear. I can still visualise him walking away from our house. He was in civilian clothing and carrying a “ Gladstone” bag. I was standing at the front gate of 160 Hubert St as he walked away down Somerset Street towards Albany Highway to catch a tram. I have since assumed he was on his way to a collection centre, along with others like him who had already enlisted. My father left Fremantle, Western Australia, on the 31 st May 1941 in a ship of 6600 tons, called Zealandia. This ship was later sunk in Darwin harbour on the 19 th February 1942 during a Japanese air raid. There were also hundreds of other volunteer servicemen on this ship heading for Malaya in 1941. During most of the voyage they were escorted by H.M.A.S. Sydney II. This ship was later sunk with the loss of every member of the crew, (645 men), on 19 th November 1941. The sinking was somewhere off the W.A. coast, well out to sea from Geraldton. Four weeks after her 34 th birthday, my mother was left on her own to raise three children whose ages ranged from Pamela, almost 11, Daphne just 9 and myself 7. She must have had doubts, even then, that there was a possibility she would never see her husband again. Only in recent years have I started to understand a little of how difficult this must have been. I now need to pause the story long enough to explain something about why my father ended up in the R.A.F.V.R. and not one of the Australian services. To the best of my knowledge, since the event, I believe he tried to join the R.A.A.F. to go to Malaya. The prospect of a Japanese invasion into Australia was even obvious in early 1941. I think he was rejected by the R.A.A.F. based on medical reasons (probably his eyesight as I know he wore strong glasses). What happened after this I don’t know, but he succeeded in joining the English air force, the R.A.F., as Pilot Officer Vernon Hopetoun Smith, R.A.F.V.R. No. 117114. From the time my father left Fremantle until the 6 th April 1944, he kept a diary. The diary notes are very brief and often have big gaps between entry dates. He arrived in Malaya in early June 1941 and spent the first six months training. Most of this was in the northern state of Kedar at Alor Star and nearby towns. By now he was promoted to the rank of Flying Officer and the Japanese had bombed Pearl Harbour (December 7 th 1941) and entered the Pacific war. The withdrawal of the R.A.F. down the Malay Peninsula as the Japanese advanced from the north is a part of the detail in my father’s diary. He and others from his “school” evacuated from Singapore on February 8 th 1942 to Java. His diary details their movements around Java for the next few weeks. I assume they were trying to escape from the Japanese who, by this time, had overrun most of Malaya, Borneo and Indonesia. My father was captured by the Japanese at a place called Tjasikmalaya, about 200 km S.E. of Batavia (now called Jakarta). The date was 8 th March 1942. It was a Sunday and the time was 11am. He was now a Prisoner of War. He and the others that were with him when he was captured were taken to an old Dutch barracks at a place named Singo Sari. I think this must be somewhere near the city of Malang which is South of Surabaya, on Java, and about 500 km east of where they were captured. His diary describes many of the daily incidents during the period of about six months that he spent imprisoned on Java. Late September 1942, a group of prisoners were moved by train and then by ship out of Java and back to Singapore. The diary details this. They arrived at the notorious Changi P.O.W. camp on the 26 th September. The stay here was brief. By 10 th October, he and about 2000 other prisoners were shipped, by the Japanese, to Borneo. About half the number were unloaded and sent to Kuching camp when they arrived on the 11 th. My father remained with the other half that were shipped up the West coast of Borneo to Jesselton (now known as Kota Kinabalu). They were imprisoned here from October 19 th 1942 until 6 th April 1943. Again the diary gives some life to the events in prison camp. On the 6th April 1943 my father, along with many others, was sent to Sandakan. The prison camp here was run by an infamous Japanese Officer named, Lt. Hoshijima. He is mentioned by my father in the diary. Hoshijima was trying to build an airstrip not far from Sandakan by using Prisoner of War labour. As 1943 progressed and 1944 began, the tide of war was turning against the Japanese. Allied attacks on the airfield eventually caused the Japanese to give up hope of finishing the project and as a result the prisoners in Sandakan became a liability to their captors. They were systematically starved and so ill treated that hundreds died, but the final solution for the Japanese was to march these sick prisoners on an impossible journey to Ranau, through some of the worst jungle in the world. Of about 2,500 prisoners in Sandakan, only six men survived. The full story of Sandakan and the “death marches“ is one of the worst atrocities of the Pacific War. 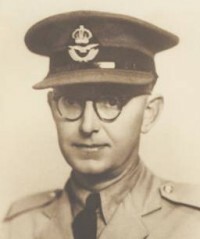 But before the death marches occurred , the Japanese sought to break down the internal organisation in the prison camp by removing most of the officers .Perhaps this could be considered a fortunate thing for my father,for on 17 th August 1943, he and the other Officers were shipped back to Kuching. He describes the trip including a mention of a stop at the island of Labuan in his diary. Little did he know then that this pretty island in the China Sea would be his last resting place. The officers, including my father, arrived at Batu Lintang P.O.W. camp Kuching, at 11 am 26 th August 1943. He kept the diary as current as possible until 6 th April 1944, where his last entry referred to his 15 th wedding anniversary and my birthday. I do not know why he made no more entries in the diary after this date. There was still some space on the last page he had been using and I have found some other entries in another notebook that are dated about a month before his death. The diary was not found by the Japanese so the reason for it stopping at 06/04/1944 will remain an unsolved mystery. After reading the diary many times I feel that there is a perceptible change in my father’s attitude in the entries of the last few months up to April 1944. I suppose this is to be expected considering the conditions of their confinement and deprivation. Beside the physical problems of life in that environment we have no conception of the emotional pressures. I cannot begin to understand how anyone could survive this treatment. In February 1998 my wife, Colleen, and I visited Borneo. We were able to discover and visit Batu Lintang about 5 km south of Kuching where my father was imprisoned and died. We also stopped for a day on Labuan Island where we visited my father’s grave at the Commonwealth War Graves Cemetery. He and thousands of other victims of war were identified and were reburied on Labuan. The official cause of my father’s death was given to his next of kin as malnutrition and dysentery. He died on the 21 st July 1945, two days before his 45 th birthday and 24 days before the Japanese surrendered to end World War II. Because the diary is the only document in existence that gives details of the events between May 1941 and April 1944, about my father’s life, I now want to tell the story of the diary papers themselves. The “DIARY” consists of three sheets of very light weight paper about 160 mm x 215 mm. Three years of significant events in one man’s life are written on these pages in the smallest writing you can imagine. Both sides of the paper were used and all of the writing is in ink. The diary had to be kept hidden from the Japanese throughout the period of confinement. It was an extremely serious offence to keep any records while a prisoner of the Japanese. The sheets of paper were always kept in the back of a shaving mirror owned by my father. They were only discovered some time after the end of the war by an English prisoner, from the same camp, who bought or had been given the mirror after my father’s death. He recognised the sentimental significance of them and managed to get them to my mother soon after finding them. When I set out on this project about my father’s life, I thought I would write this introduction in less than a page. You can see that I have not (editor’s note: original document was three pages). However I hope I have achieved one of the goals I set myself and that was to write the story to give the grandchildren of Vernon Hopetoun Smith the opportunity to know something about a man I called my father and a man I remember as a kind, loving and understanding person. I regret that I did not have long to know him but making this study of part of his life has been good for me.